From left are Xiao Wang and Professor Fen Ding of Materials Science and Engineering. Their findings published in the February issue of the prestigious journal Nature. 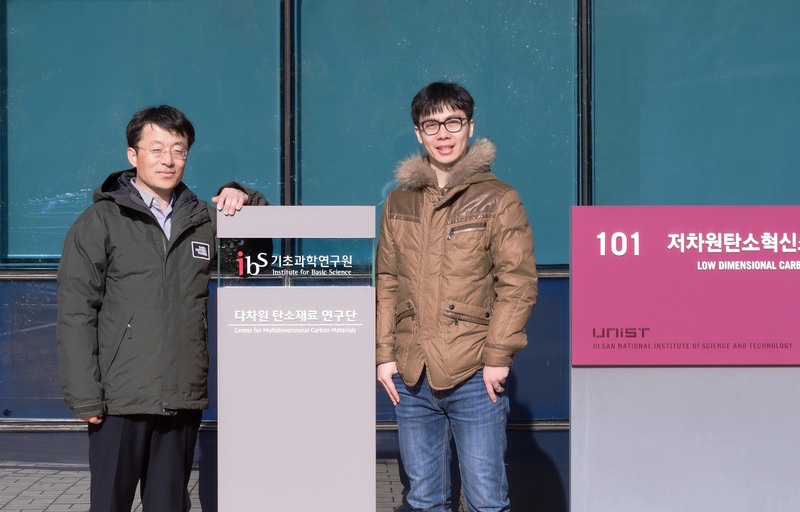 A recent study, affiliated with UNIST has demonstrated how to control the synthesis of special tiny carbon cylinders known as carbon nanotubes (CNTs), in order to synthesize horizontal arrays of CNTs with the same structure. This study has been jointly conducted by Distinguished Professor Feng Ding’s team from the Center for Multidimensional Carbon Materials, within the Institute for Basic Science (IBS) at UNIST, in collaboration with Professor Jin Zhang’s team, at Peking University and colleagues. The results of the study has been published in the February issue of the prestigious jornal Nature. 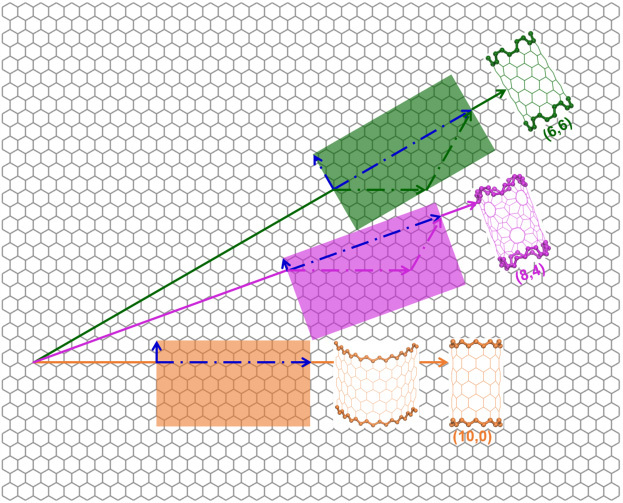 ▲ Illustration of rolling graphene into carbon nanotubes (CNTs) of different structures, denoted by two indices, like (8,4). Due to their exceptional mechanical, electrical and thermal properties, CNTs are considered an excellent alternative to silicon for next generation microelectronics. However, since CNTs’ electronic properties are structure dependent, finding a reliable way to synthesize CNTs with the same structure, rather than a mix of different types, have kept scientists puzzled for the last 20 years. CNTs resemble sheets of graphene rolled up to form tiny tubes, 100,000 times thinner than a human hair. In reality, however, no rolling is involved in the synthesis process, and CNTs usually grow from the surfaces of tiny metal particles, called catalysts, via catalytic chemical vapor deposition. Beyond being a supportive structure, the catalyst decomposes hydrocarbon molecules into carbon atoms that form the carbon nanotubes and facilitates the insertion of carbon atoms into the growing cylinder. In 2014, Ding and his collaborators discovered that using solid metal alloy catalysts, such as W6Co7, can lead to the synthesis of CNTs with specific structures. In their most recent paper, they expanded this knowledge much further. 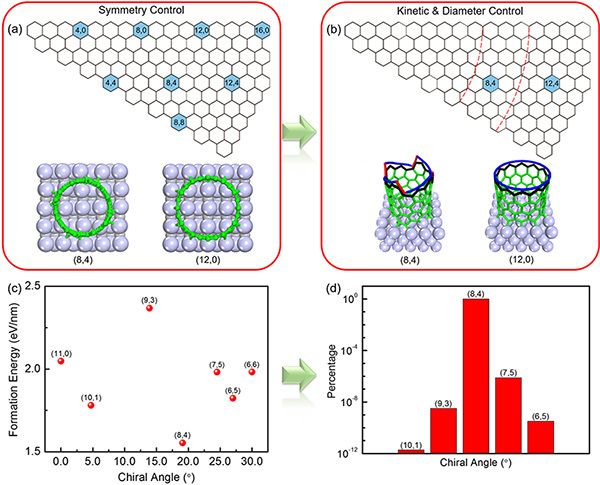 ▲ Dominance of the semiconducting (8, 4) CNTs when tungsten carbide (WC) is used as catalyst. (a) Raman measurement clearly indicates the predominance of CNTs with the (8, 4) structure in the sample prepared using WC as catalysts. (b) Both transmission electron microscopy (TEM) imaging and electron diffraction pattern of the synthesized CNTs proved that the structure of the dominating CNTs is (8, 4). Like in a battleship game where the position of the boats is defined by two numbers, the structure of CNTs is defined by a pair of indices. IBS scientists found they could grow both conducting (12, 6) and semiconducting (8, 4) CNTs with very high selectivity. These structures are highly desired for possible applications in transistor devices. Considering the symmetry of the catalysts, the kinetics of CNT growth and the size of the catalyst particles, the researchers could tune the production of CNTs towards one predominant type. When using tungsten carbide (WC) as catalyst, the (8, 4) CNTs are found to grow preferentially, while if molybdenum carbide (Mo2C) was used, the (12, 6) structure was predominant. “A specific catalyst can produce a specific group of CNTs as they share the same symmetry,” explains Prof. Ding. Moreover, the CNTs grow in parallel on a substrate and therefore can be used for device applications directly. The (8, 4) CNTs’ purity reached 80-90%, which is among the highest that has ever been achieved experimentally. “The theoretical calculations demonstrate that the selectivity could be greater than 99.9%, indicating that there is still a large scope for improvement,” explains Prof. Ding. After producing semiconducting (8, 4) CNTs arrays for the first time, the team aims to understand and control the formation of all types of carbon nanotubes, and improve the selectivity in the future. Shuchen Zhang, et al., “Arrays of horizontal carbon nanotubes of controlled chirality using designed catalysts,” Nature, (2017).